Do You Believe It Has To Hurt In Order To Work? Today, I am in Dallas, Texas, at the Ewomen Network Convention. Just like I do on any other day, I figured out when I could exercise, because moving my body on a daily basis is part of being a healthy person. So I got up early to hit the hotel gym before everybody at the convention did the same thing. Just as I was starting on my lunges, a man came and sat down on the bench near me. He was a personal trainer with a backwards baseball cap on his head. He was carrying his clipboard. About 10 minutes later, his two clients showed up. They were both women who weighed at least 200 pounds. I continued on lifting weights while this gentleman put these ladies through their paces. He had them doing high impact exercise – jogging in place, which obviously put huge stress on their breasts and their bones, even more stress than they were already carrying due to their excess weight. And he had them doing very intense unsafe exercises like leg raises with their legs hovering over the ground. The ladies frowned the entire time, and I could overhear one of them talk about how much she hurt. He just told her to keep going. Meanwhile, there I was. I would do a set of very safe, completely efficient whole body exercises, such as a dead lift. Then I would stretch to balance my muscles. The entire time I worked out, I felt good. I still feel great hours later. It was clear to me that the fitness trainer did not understand how to work out heavy set individuals without actually injuring them. I wondered how long those ladies would keep up that kind of exercise. No matter how much weight they had to lose, how long would it be before they noticed that they had strained their back with the leg lifts or crunched their sacrum with the high impact pounding? Would they develop a belief that if they worked out, they would just feel bad during their workout and feel even worse afterwards? And what were their beliefs about their bodies – did they feel like they needed to be punished? Later in the morning, I went outside to practice tai chi and qi gong. Another woman at the convention asked approached me afterwards. She told me that her boyfriend had bought her sessions with a trainer but that she had gone to only one session. She took a break in the middle to say a prayer so that she could get through to the end because she felt like throwing up. She told me she had never found a way to move her body that actually felt good. Was it possible she could practice the graceful art of tai chi and achieve her ideal size? I think that many people believe their exercise has to hurt in order to work. You don’t have to do high impact, high intensity exercise in order to lose weight, achieve your ideal size, tone your muscles or look amazing. I wish I could deprogram every woman who feels like she has to join a boot camp, take up marathon running, exercise more than hour a day or work out until she was in pain. If you read over any of the newsletters from www.totalfitness.net, you will learn that this kind of movement is totally counterproductive for anyone with a damaged metabolism. It will not only cause you pain and possibly injure you, it could potentially actually make you fatter. And even if you are really really healthy, it’s not that great of an idea to begin with because there are easier way to look like a million dollars. This is a photo of my client Barrie Moore, who came to visit me from England this past March. Working over the phone to heal a number of issues, I had encouraged Barrie to find a tai chi teacher in his home town of Lincoln, England. 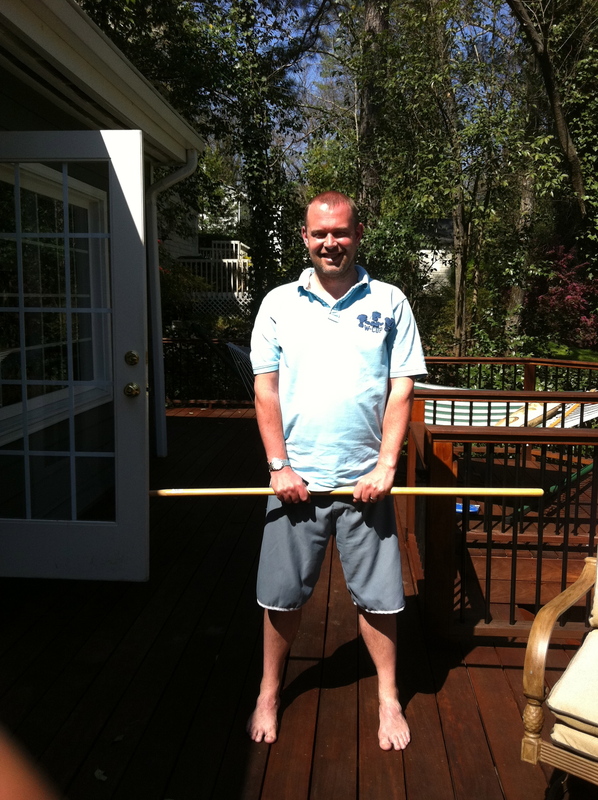 While he was visiting me in Atlanta, I taught Barrie a series of simple exercises to do with a stick that would improve his posture and get rid of back, shoulder and neck pain. You can see that Barrie looks amazing, radiantly healthy, at a normal weight. His workout is 100 percent pain-free. Whatever you do for your daily movement, learn how to work smarter, not necessarily harder.